A sequence of infrastructure projects is positioning Georgia for the future. But it’s the people of Georgia who will get you there. This spring the U.S. Army Corps of Engineers completed a feasibility study that concludes the $652-million Savannah Harbor Expansion Project will provide $174 million in annual net benefits to the nation. Above, a container ship laden with exports transits the channel past downtown Savannah toward the Atlantic Ocean. he only thing in Georgia as effective as its layers of logistics assets is the team of people ready to help put those assets to work. Collaboration and teamwork are typical, rather than surprising. Take International's billion-dollar biologics manufacturing plant that broke ground this summer at the Stanton Springs site in Covington developed by a four-county coalition. Or Caterpillar's decision earlier in the year to locate a manufacturing plant at a longstanding candidate site at the juncture of two counties near Athens. It begins at the top, where Gov. Nathan Deal and Atlanta Mayor Kasim Reed, among others, have led the charge for the expansion of the Port of Savannah. It continues through the Georgia Department of Economic Development's vast and deep pool of resources, including teams devoted to existing industry, global commerce and international trade, as well as its Centers of Innovation program. And it reaches full flower in the strong array of partners, from communities to utilities to higher education to the Georgia Allies, a partnership between state government and private corporations. "No matter how big or small the project is, the Georgia team is flexible, responsive and creative in helping that company find the right solution here that will bring it business success," says Chris Cummiskey, commissioner of the Georgia Department of Economic Development. "We're able to adjust to a company's timeline, as we demonstrated with both the location, which took four years, and with Caterpillar, which took about four months. Those are both very large customers, of course, but the bulk of our corporate activity involves companies with 100 employees or fewer. We are also very conscious of the needs of our existing companies and do a considerable amount of outreach to them. So we have a lot of capabilities to flex in a way that works for the company." "My career has been dotted before this by job bouncing around the U.S." says Curtis Foltz, executive director of the Georgia Ports Authority, "and I can say without any hesitation that you won't find a state that works together in terms of economic development as strongly as the State of Georgia does today." Asked if he thinks Georgia is getting its share of reshored manufacturing jobs, Gov. Deal says, "We knew much of what we lost was labor-intensive manufacturing that went to low-cost countries. But we're seeing a reassessment in terms of the overall effectiveness of the work force, not necessarily the wage rates." Citing major projects in his state from Kia and Caterpillar, he says, "I think Georgia is ideally suited to take advantage of this rethinking of where manufacturing is going to be located." Fresh from a trade mission to Switzerland and the Netherlands this summer, he says companies with operations in the European Union may be looking to North America as they make long-term location decisions. "I think Georgia is going to benefit," he says. Switzerland-based firm Interrol, whose slogan is "Inspired by Efficiency," is a supplier of conveyor systems and components that might be said to lie at the beginning of the logistics ecosystem. In July Interrol chose Paulding Commerce Park in the town of Hiram in Paulding County on the western outskirts of Atlanta to establish a new $10-million, 70-job North American Regional Center of Excellence. The project follows the company's acquisition of a 10-person metal fabrication facility there in 2009. "Today's dynamic business environment calls for an equally swift and well-judged response. Working with our own just-in-time production system, we help our customers optimize their supply chains, allowing them to focus on what they do best," said Interroll CEO Paul Zumbuehl. "The Paulding facility will be one of the 11 premier Interroll facilities around the world and is a location we will be proud to show our customers." The Georgia Department of Economic Development (GDEcD) partnered with Paulding County Economic Development (PCED), Paulding Industrial Building Authority, Paulding Chamber of Commerce, Metro Atlanta Chamber and Georgia Power to secure the project. Gov. Deal and Mayor Reed come from different ends of the political spectrum. But they meet on common ground: the importance of the Port of Savannah to their state's economy. They have pointed the way to the future in their united support of deepening the port's channel — convening discussions, traveling to the nation's capital and putting skin in the game, including more than $181 million in state funds. The Savannah Harbor Expansion Project (SHEP) effort, begun 15 years ago before either gentleman was in office, appears to be nearing the finish line: This spring the U.S. Army Corps of Engineers completed a feasibility study that concludes the $652-million project will provide $174 million in annual net benefits to the nation. For every dollar spent on this critical infrastructure improvement, $5.50 will be returned in benefits to the nation, the Corps' studies showed. This summer, the White House listed the project among five East Coast port projects that will receive expedited federal review, slated to be complete by November 2012. It was one of two transportation projects in Georgia put on the White House fast track, the other being a major multimodal passenger transportation hub in "the Gulch" in the City of Atlanta. The Port of Savannah has been revving for some time now. It was the second busiest U.S. container port for the export of American goods by tonnage in FY2011. It also handled 8.7 percent of the U.S. containerized cargo volume and 12.5 percent of all U.S. containerized exports in FY2011. Foltz says the port's success is predicated on a number of factors, beginning with simple customer demand and shipping volume: "Our customers have chosen us as a gateway," he says. "You really start, in my mind, with an undeniable fact. We're ideally located to reach the demographic strength of the Southeast," as both the populace and the population of manufacturing projects migrate to the region. Balance is the order of the day, with exports currently comprising 54 percent of fully laden containers transiting the port. It's only six miles to the junction of I-16 and I-95. And both CSX and Norfolk Southern operate intermodal facilities inside the GPS terminal. Layer onto that the port's single-terminal operations philosophy, and you have a recipe for logistics leadership. Taking the channel from 42 ft. in depth to 47 ft. will allow the port to accommodate the world's largest container ships, and position the port to take full advantage of the expanded Panama Canal when it comes online in 2014. How important can five feet of water be? A chorus of corporate and government leaders will tell you. "The Port of Savannah is a vital part of the supply chain for Target and many other companies," said Rick Gabrielson, director of international transportation for Target and president of the Coalition for Responsible Transportation. "At Kia Motors Manufacturing Georgia, we've experienced the value of this port firsthand and realize how critical of a resource this is for the state," said J. Randy Jackson, vice president of human resources and administration, Kia Motors Manufacturing Georgia, Inc., whose plant in West Point, Ga., at the Alabama line, has already expanded twice in its short life. "This project will benefit KMMG and our suppliers, which combined, employ more than 10,500 in this region alone." Governor Nathan Deal speaks to more than 1,600 attendees from 28 states and seven nations at the 2012 Georgia Logistics Summit, hosted by the Georgia Center of Innovation for Logistics, one of six Centers of Innovation operated by the state. Other statements came from leaders at Rayonier, Eastman Chemical, Volkswagen Group of America, Dollar Tree, JBS, The Home Depot and Lowe's, as well as the USA Poultry & Egg Export Council, whose president James H. Sumner noted, "It's no coincidence that Savannah is America's single largest gateway for poultry exports and that Georgia is the nation's leading producer of chicken." Shan Cooper, vice president and general manager at Lockheed Martin Aeronautics massive plant in Marietta, says the state's roads, Interstates, airports and seaports can be summed up in one word: commerce. "I feel very confident in saying that Georgia is a gateway to the world — thanks in large part to its strong logistics backbone," she says. "If we didn't have these assets, we wouldn't be able to support the work demanded by our current economic structure and international customers. They allow us to bring parts into Marietta from our 350 suppliers across the state and others around the world — then build and fly out the world's greatest aircraft. Our employees strive to deliver these aircraft on time and affordably for our customers. We couldn't deliver on those promises without Georgia's logistics infrastructure. We couldn't do what we've done here for 61 years with our manufacturing and aeronautics partners without the state's ever-evolving logistics resources." A study released in May, "The Economic Impact of Georgia's Deepwater Ports" by the Selig Center for Economic Growth at the University of Georgia's Terry College of Business, found that the ports in Savannah and Brunswick reach into every corner of the state, supporting 8.3 percent of total state employment, or 352,146 full- and part-time jobs. Statewide FY11 impacts included nearly $67 billion in sales, $32.4 billion in state GDP (7.8 percent) and $18.5 billion in income (5.2 percent). Nearly 157,000 of those jobs are in metro Atlanta. "Port operations help preserve Georgia's manufacturing base, support Georgia's agricultural economy and foster growth of the state's massive logistics, distribution and warehousing cluster," said Dr. Jeff Humphreys, director of the university's Selig Center for Economic Growth. Cold storage has been identified as an opportunity nationwide. But Georgia's agriculture and food industry base makes it especially vibrant in the Peach State. One of the nation's top frozen warehouse companies, Nordic Logistics and Warehousing, based near Atlanta, maintains over 36 million cubic feet of flexible, temperature controlled storage in Georgia and the Carolinas. Its primary customers are major poultry producers. Poultry is an $18.4-billion industry in Georgia, and nearly 40 percent of U.S. poultry exports move through Savannah, where Nordic's newest project is a $50-million, 400,000-sq.-ft. facility. Phase one of the project is projected to be complete by the end of 2012. By the time phase two is complete in mid-2013, the company expects to employ as many as 200 at the facility, which will be able to blast freeze 15 million pounds of product per week. Not only will the facility help Nordic strategically, it will fill a need in Savannah for cold-chain space in demand by port customers. The port is adding refrigerated rack space as year-over-year demand has spiked. In addition to the state team, among the agencies helping bring the project to fruition were the City of Pooler, the Savannah Economic Development Authority (SEDA), the Georgia Ports Authority and Georgia Power. Ross Maple, Nordic's director of business strategy, says the firm has always wanted a facility at the port, and looked hard at Savannah and Charleston two years ago. "Our customers are who really sold us on Savannah," he says, saying it offered them more opportunities for their export customers. The project drifted, but a new site search was jump-started by Nordic's acquisition last year by American Infrastructure Investors. "We did due diligence on all the ports in the Southeast," says Maple. "They don't offer the things Savannah offers." The facility will be on Jimmy Deloach Parkway, part of an ever-improving network of feeder roads in and around the port. Maple points out trucking advantages in Georgia: "You can move 100,000 pounds, and in a lot of states you can't do that. When you're looking at 40,000 pounds of freight in a trailer, it's a big deal." The company, which also recently expanded in Rockmart in North Georgia, also handles such products as frozen vegetables, ice cream, breads and bread products, and is looking into pharmaceuticals as a new sector for its cold storage services. Meanwhile, the port is bringing it business. "Even before this building was off the paper, the port had mentioned imports to us, so we added 20,000 square feet that could handle import products. Two of our customers that were bringing product into Philadelphia will bring it into Savannah instead. When we told them we were building something in Savannah, they said, 'It's about time.' "
Brandt Herndon, vice president of business development for SEDA, says a lot of project activity is cold storage-related, but there's also activity involving call centers and traditional warehouse. Half of all prospective projects are port-related, he says. SEDA benefits from regional gateway marketing partnerships involving Chatham, Effingham, Liberty and Bryan counties, and from its relationships with Georgia Power and with area educational institutions Savannah Tech (which administers the state's Quick Start program) Armstrong State, Savannah State and regional university Georgia Southern just up the road in Statesboro. SEDA is also actively fostering smaller entrepreneur-driven growth in such areas as digital media and gaming, seeking to build from ideas and connections created by the Savannah College of Art and Design (SCAD), which has steadily built an international reputation and helped redevelop downtown Savannah over the past 25 years. Herndon also says there are three aerospace projects related to the steady growth of Gulfstream Aerospace Co., which he calls the area's "other big engine" besides the port. Gulfstream, a General Dynamics company, completed a four-year, $400-million, 1,100-job expansion in Savannah in 2010. Then in November of that year the company announced a $500-million, seven-year expansion plan that is adding production, product support and engineering capacity. Combined with expansions in New England and abroad, the company hired more than 1,300 people in 2011 and had hired 700 more by May 2012. General Dynamics’ Gulfstream Aerospace Corp. in Nov. 2010 (left) announced a $500-million, seven-year plan to expand its facility footprint in its hometown of Savannah. The plan is expected to result in the addition of 1,000 new jobs to the payroll of 5,500. Among the recent innovations from Gulfstream is the soon-to-debut G650 (pictured). New capabilities in Savannah include a new in-flight support center that opened in 2011, increased space at the company's R&D campus in Crossroads Business Park (which employs 1,450) and new facilities at Savannah/Hilton Head International Airport. The seven-year expansion is adding another 1,000 jobs to bring Gulfstream's eventual Savannah payroll to approximately 6,500 people. "The effect this initiative will have is very simple," said then-president Joe Lombardo, now executive vice president of the Aerospace Group for General Dynamics Corp., at the Nov. 2010 announcement. "It's jobs for 'G-A.' That means good, high-tech jobs for Georgia. Jobs for Gulfstream Aerospace. And jobs for general aviation, a vital aspect of this nation's industrial base." Gov. Deal calls aerospace opportunities "the kind of future growth we want for our state." The Georgia Centers of Innovation (COI) program, headed by Mark Lytle, provides Georgia's aerospace, agribusiness, energy, life science and information technology, logistics and manufacturing industries though leadership, connections and access to the state's research resources. Lytle says the program has helped thousands of Georgia companies in its 10-year history. In the most recent fiscal year (ending June 30, 2012), the Centers assisted more than 2,600 clients, 300 of which specifically sought the expertise of the logistics team. The Center of Innovation for Logistics is the leading statewide resource for fueling logistics industry growth and global competitiveness. The Center directly helps companies overcome challenges and capitalize on opportunities related to the movement of freight, providing expertise, specific industry data, connections to state resources and an extensive cross-sector industry network. The Center has main offices in Savannah and Atlanta, but has activity in all parts of the state. The Center represents all segments of the logistics industry and provides a unique platform for companies to network, address industry issues and share knowledge. "With the many unique logistical advantages in Georgia, we are top-of-mind for companies of all types and sizes," says Page Siplon, executive director of the Georgia Center of Innovation for Logistics. "We also know that logistics is not just about Georgia, it is a globally interconnected system. We understand companies need to efficiently and cost effectively move products to customers no matter where in the world those customers may be. Georgia is a great gateway in so many ways and we help private industry understand and leverage it." The state's Annual Logistics Summit, hosted by the Center, will take place March 19-20, 2013 in Atlanta. The only state-led collaborative event of its kind and size, the summit has grown in attendance every year, from 450 in 2009 to over 1,600 participants from 28 states and seven countries in 2012. Eighty-five percent of the participants come from private industry, and all indications are for the summit to attract even more in 2013. 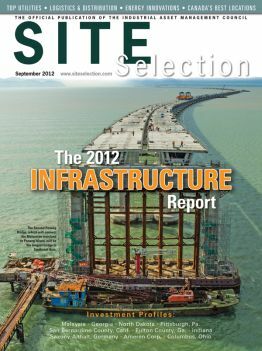 The chart on p. 92 offers a sampling of the projects with a logistics component that have prospered in the Peach State. Since the beginning of 2010, logistics account for 20 percent of total corporate projects and for a whopping number of jobs. Even as the port expansion process has lumbered forward, however, that massive logistics cluster has not paused. Nor has the manufacturing sector. A recent speaker at the Georgia Logistics Summit was Alan R. Horne, global sales supervisor for Suzuki Manufacturing of America, which operates its only ATV manufacturing facility in the U.S. in Rome, Ga.
With 4,700 miles of rail, Georgia has the most extensive rail system and largest intermodal hub in the Southeast. Pictured is a terminus in Greater Atlanta, which is the Southeast operations hub for both CSX and Norfolk Southern. Atlanta ships and receives 33 percent of total intermodal rail containers transiting the Port of Savannah. "We located there in 2001, and it accounts for 75 percent of Suzuki's worldwide ATV production," said Horne. "Fifty percent of production is exported. The reason for locating here was this is the premier market for ATVs, whether sport, child or utility." Horne said the labor environment was a big attraction as well, in addition to programs such as Georgia's pioneering Quick Start training program. But it took some time for the company to see the light in Savannah. "Considering the frequency of vessels from Asia, it made sense to come to the West Coast, onto rail and down to Rome," he said of the company's initial approach in 2001. "What we found, though, was we were often dealing with labor issues. Strikes were holding up our parts and ultimately affecting our production model." There were often weather-related issues with rail as well, he said, not only in the winter, but in summer when the rails in some sections of the country were softened by heat. "This led us to move all shipments to Savannah four years ago," he said. "We are very happy with what's going on at the Port of Savannah." Mike Chandler, vice president, customer fulfillment for NCR Corp., recounted the family of projects the company has brought to Georgia, including its headquarters move from Ohio to the Gwinnett County city of Duluth in northeast Atlanta. Its two manufacturing campuses in the state make ATMs in Columbus (near the Alabama state line) and make hospitality and specialty retail point-of-service products in the northern Atlanta suburb of Alpharetta. A fulfillment center is located in Suwanee, another northern Atlanta suburb. Meanwhile, its global services center in Peachtree City, a community known for its golf cart paths that is located near Atlanta's Hartsfield-Jackson International Airport, is home to NCR University. Hartsfield-Jackson Atlanta International Airport opened its new $1.4-billion international terminal (pictured) in May. In addition to being the world’s busiest passenger airport, the complex has seen cargo shipments increase by 16 percent over the past few years, welcoming new cargo business from Singapore Airlines (insert) and Cargo Italia, among others. "We are very centralized in Georgia," said Chandler. "Why are we in Columbus? Look at where the U.S. population is. Columbus makes perfect sense to deliver our products to our customers. There's great infrastructure here to move product through to financial institutions." As for the airport, Chandler said, "It's wonderful to have a world-class airport so we can bring customers in and show them what we have." Chandler praised the state university system as well, citing partnerships the company has formed with Georgia Tech and with Columbus State University. If the airport and ports are the twin drivers of much of state commerce, it stands to reason that the crescent of communities circling south of Atlanta proper stands to benefit, as they offer not only immediate airport proximity, but are that many minutes closer to Savannah. Since 2007, 13 major corporate facility projects have located in Henry County, all in McDonough. They come from such companies as Kumho Tire, Whirlpool, Lennox Industries, ALPLA Plastics, Phillips Van Heusen, Atlas Cold Storage and CEVA Logistics. The newest, however, comes from a Georgia-born and bred company — The Home Depot — which this summer finalized its long-rumored decision to build a huge new direct fulfillment center (DFC) in McDonough, creating 250 jobs with an investment of $50 million. Home Depot spokesman Stephen Moore says it's a relocation of the company's closing DFC in Baton Rouge, which the company had acquired several years ago. "It supports our online business," he said of the new facility. "We were looking for something more in the eastern United States, which is a simple function of the concentration of our online orders. This takes care of the Southeast for us." Moore says McDonough's great access to I-75 and to the major Interstate arteries of the Southeast was the biggest reason behind the site selection for what passed in Henry County for months as "Project Gemini." It's not the first time "The Depot" has landed there: The company also operates a stocking distribution center, a hurricane operation and a new returns consolidation facility in McDonough. "The proximity to transportation is why we're there," says Moore." Much of the company's development over the past few years has been in support of its online business growth, says Moore. A typical Home Depot store might have up to 40,000 SKUs, he says, whereas "online, we're up to about 300,000." Among a wealth of successful pro-economic development legislation to pass in 2012 in Georgia was a measure to collect e-commerce sales tax from transactions by out-of-state retailers. In the eyes of many, the new law levels the playing field somewhat for brick-and-mortar retailers as well as those giants such as The Home Depot who sell across the entire spectrum. Moore says local economic developers "are a critical piece, helping finalize what we do." Bob White, executive director of the Henry County Industrial Development Authority, has been in economic development for 26 years, and watched the logistics industry grow from a time when 250,000 sq. ft. was considered large. He says his county's seven I-75 interchanges have helped the county become a logistics leader, and a Norfolk Southern mainline helps too. But it's the area's agricultural legacy that has prepared the ground for the crop of big boxes from both end users and top-tier developers such as First Industrial, Prologis, Panattoni and Duke. The relatively flat land lent itself to large buildings looking for a place to locate. "We have more than 20 in the county that are more than 400,000 square feet," says White, among them a new 900,000-sq.-ft. building from Georgia Pacific. Parts distribution facilities from Ford, Mazda and Caterpillar have also found a home in the county. White has seen boosts from niche areas of logistics such as consolidated returns processing and cold storage. De Wafelbakkers, a frozen pancake and waffle maker, this summer opened a new $27.5-million, 240-job manufacturing facility in the county in part because the site was adjacent to an Americold facility next door. One of White's first projects in the county was when Sunglass Hut chose to situate a major distribution center in the county in 1995, to serve stores in the U.S. and the Caribbean. Today the brand is owned by Italy-based conglomerate Luxottica, which purveys such brands as Ray-Ban and Oakley and is the largest eyewear manufacturer and retailer in the world. "The company has continued to enjoy the cargo capabilities of both the airport and port, as well as the ease of passenger travel to Italy and to most major cities in the Americas." The McDonough facility has doubled in size since its location, and continues to be strategic. Just ask Pedro Carreras, vice president of logistics, who's been based in Henry County since the facility opened there in 1996. At the time Sunglass Hut was operating out of six different distribution facilities in six different cities and three states, with four of those facilities in Florida. So consolidation was in order. "After carefully analyzing different sites/cities/states we decided on Henry County for several reasons," he says — the ability to ship to over 50 percent of stores via ground; availability of space; quality, experienced personnel; and a location a couple of miles from I-75 and only 30 minutes from the airport. Since that time, the company has continued to enjoy the cargo capabilities of both the airport and port, as well as the ease of passenger travel to Italy and to most major cities in the Americas. Asked where else the company has considered as it's grown over the years, he says, "No other sites have been considered since 1996." The Home Depot is growing in its home county of Cobb in northwestern metro Atlanta, opening this summer a $20-million customer support center in Kennesaw. Company spokesman Moore says the facility will go completely live in October, and matches up well with a companion facility in Ogden, Utah. Moore says the area's strong higher education resources across Southern Polytechnic, Chattahoochee Tech and fast-growing Kennesaw State University were "definitely part of our consideration" in siting the center, whose initial payroll of 400 is projected to grow to 700 by 2015. One core goal of Cobb's Competitive EDGE (Economic Development for a Growing Economy), an initiative led by the Cobb Chamber and its community partners, is to build stronger programs to help existing companies to continue to grow and prosper. Brooks Mathis, vice president, economic development for the Cobb Chamber, says existing companies have been the linchpin of project activity this year, including a support center expansion by Alorica that features 300 full-time jobs and 700 seasonal positions every year. Other new projects have come from PointClear, Atlanta Bread Co., Novelis (R&D), Fresenius Medical Care, Osmotica and, in August, Talenti Gelato. Mathis says refreshing the county's incentives has helped, as the policy had not been tweaked since the early 1990s. Now, says Mathis, the area needs to double down on its transportation focus. "Transportation issues are a key for a lot of these companies," he says. "If office space is comparable to another market, transit lines are an added bonus. It's one of the first questions you see on an RFI — whether a site is on a transit line, connected to an airport. International companies are used to having that connectivity." That said, Cobb continues to benefit from the transport infrastructure it already has, with I-20, I-75, I-575 and I-285 passing through the county. Mathis says the Chamber hopes to add a customs capability at the Cobb County airport, McCollum Field. But perhaps the area's biggest calling card continues to be the presence of Lockheed Martin Aeronautics at Dobbins Air Reserve Base in Marietta. Lockheed Martin's massive 8.7-million-sq.-ft. operation, in operation for 61 years, employs more than 7,600 people. Shan Cooper, Lockheed Martin Aeronautics vice president and general manager since 2011, takes her role as an economic development leader seriously, co-chairing the Cobb Competitive EDGE committee. "A great deal of vision and work have been invested to ensure that Cobb County is where it is today" she says, "and it's going to take just that much work — or more — to maintain this level of economic success." The Lockheed Martin C-130J production line in Marietta, Ga. The plant’s 7,602 employees reside in 53 of Georgia’s 159 counties. Asked for her assessment of the state and area business climate, Cooper says, "Like many other companies, we have very real and defined economic constraints in our immediate radar. We settled in Marietta in the early 1950s because the U.S. Government (our biggest customer and landlord) decided it was economically viable to do so and it still does today." But daily scrutiny of costs and efficiency are bringing an increased focus to bear on utility costs, which totaled more than $27 million in 2011, including $19 million for electricity alone (second only to the company's California facilities in total electricity cost). "We are on a quest to reduce our usage by doing things like consolidating operations in fewer buildings, installing energy-efficient lighting, reducing work days, putting in energy-saving controls and more," says Cooper. "It's an issue we are very passionate and concerned about." A new lighting system in the company's main production area uses 40 percent less energy than the previous system — "This is big when you're talking about a 3.4-million-square-foot structure," says Cooper. Over the past nine years, the operation has implemented energy-saving projects that have yielded annual savings of $3.5 million, and recently installed a reverse osmosis system that saves more than 200,000 gallons of water per day for both the Lockheed Martin campus and Dobbins Air Reserve Base. "We work closely with Georgia Power as a partner with our energy efficiency reduction goals," says Cooper. The company's Marietta site works directly with faculty, staff and students at Chattahoochee Technical College, Southern Polytechnic State University, Kennesaw State University, the Atlanta University Center and Georgia Institute of Technology. Among the newest programs is an eight-week aero structures training program at Chattahoochee Tech. "We are dependent on these schools not just for their students and alumni, but for the technology and innovation they are pioneering. These schools drive our economy and innovation. It's not just smart for Lockheed Martin to partner with them — it's essential." The Home Depot in the past five years has invested in at least two dozen new facilities in North America, including Georgia facilities in Macon and in Lowndes County, home to the city of Valdosta — only three hours from Savannah and 2.5 hours from Jacksonville, Fla.
Andrea Schruijer, executive director of Valdosta-Lowndes County Industrial Authority, says the situation of industrial parks on a four-lane I-75 access has yielded good results, owing to foresight by the government in growing available acreage for industrial development over the past five years from 165 acres to nearly 500 acres today. Other projects have landed from Lowe's, Smith Drugs and Dillard's. A paper mill overhaul from PCA was attracted to Valdosta over another PCA facility in Tennessee because of incentives organized by the Authority and its partners. One recent project is a 35-job warehouse from DuPont Crop Protection to support the company's manufacturing plant in Valdosta. Another comes from Southeastern Die Reconditioning, which reconditions dies used in the wood pellet and animal feed pellet industries. The firm has grown from 10 employees to 35 since relocating to the area in December 2011. Dr. Mark Groszos, associate professor at Valdosta State University, oversees eight advanced polarizing student microscopes and one research/teaching model with full digital imaging capabilities. The Valdosta area is grounded in a diversified agricultural base that includes a fast-growing pecan industry. Additional economic ballast comes from Moody Air Force Base, which has a $448-million economic impact based primarily on services to the base. Meanwhile, Valdosta State University enrollment has leapt by 15 percent in the past two years, and Wiregrass Georgia Technical College is part of a record-setting 30-percent enrollment increase across the entire 25-campus Technical College System of Georgia. Alan Ricketts, a project manager for the Authority, says the available work force exiting from the military and from the colleges is a top-of-mind issue for any corporate prospect. "There is a recognition from all industries of the skill sets and discipline folks who have served in the military can bring to their organizations," he says. "That is a potential pool of candidates for floor positions and for management. They're also interested in military family members who may be seeking employment." Ricketts says there's been a definite uptick in inquiries in the past six months, and the Authority is working approximately 10 active projects across a range of industry sectors. He says the DuPont project began in 2009, and came together because of the ability to match DuPont with a Georgia-based developer who could perform a build-to-suit. The project happened to develop at the same time the area's third industrial park is also installing infrastructure. A grand opening took place August 9. Earlier this year the Valdosta-Lowndes County Industrial Authority kicked off a target cluster analysis process, and recently benefited from a community and economic development assessment performed by Atlanta-based Janus Economics, and sponsored by Georgia Power. It's just one example of the economic development outreach of the utility. In 1962 Georgia Power became the first utility in the nation to create an engineering function strictly focused on economic development. Over the ensuing 50 years, the utility's economic development team has garnered renown for its proprietary building and site database (SelectGeorgia.com) and for the equally thorough fashion in which its team connects to those sites' host communities and occupiers. Last year, the team helped attract 10,231 new jobs and more than $2.3 billion in private-sector project investment to the state. Georgia Power has two of only 30 Certified Community Researchers (CCR) in the country on its research team, part of the one-stop shop it offers at its Georgia Resource Center. Georgia Power's holding company, Southern Company, is in its 100th year in business. Paul Bowers, Georgia Power president and CEO, says one of the founding principles was "being a citizen wherever we serve," a phrase coined in 1927 by the company's first president, Preston Arkwright. "Citizenship is the definition of economic development," Bowers says from the utility's downtown Atlanta headquarters. His career has spanned 32 years in the Southern Co. system, during which he's worked to help make deals happen, and help provide the platform for all the services companies look for besides an affordable power feed. In July, the utility concluded a six-year process by installing its final digital meter among its 2.4 million customers. The digital meters will reduce Georgia Power's annual travel by 14 million miles and take nearly 300 vehicles off the road. But there are a few trucks on the road around Waynesboro in far eastern Georgia, where the utility is strengthening the nation's and region's nuclear power profile with its $14-billion expansion of Plant Vogtle, just south of Augusta. "We're making an investment in a 60-year asset with very predictable energy prices," says Bowers. Moreover, the new nuclear units will be an important part of Georgia Power's diverse generation portfolio, which currently is dominated by fossil fuels such as coal and natural gas. Nuclear power plants, which have operated safely and securely in Georgia since 1975, currently provide more than 20 percent of the state's electricity, and nuclear energy is the only large-scale generation source that emits no carbon. Then there's the straightforward economic power of the project itself: 5,000 on-site workers; 800 highly paid individuals running the plant upon completion; and a tax base that's already contributed to new schools, libraries, fire stations and other top-notch facilities in Burke County, which boasts some of the lowest property tax rates in the state. Georgia Power always looks 20 years out as part of its integrated resource plan, says Bowers, and currently is investing $500 million a year in wire and transmission network infrastructure; $1 billion a year over the next three years in generation assets; and $800 million a year in environmental compliance. Asked about the potential growth of data centers in the age of "big data," Bowers says it's "absolutely a growth area for us," with year-over-year load growth rates between 8 percent and 10 percent. But while some utilities might fret over the strain, Georgia Power doesn't flinch. "We're used to major loads coming in and planning for them," he says, citing Southern Co.'s 46,000 megawatts of capacity across the Southeast. Pair that with the utility's low outage rate of 1.5 percent in an industry where the average is 6.6 percent, and you have the makings for a strong opportunity in a sector where Georgia and metro Atlanta already prosper. As of July, the utility's year-over-year data center load was up 7.4 percent. Pedro Cherry, vice president, community & economic development, says logistics is a key industry in terms of prospect activity right now, and sees strong foreign interest from Korea, Germany and Japan. In his travels around the state thus far, Cherry says, one thing is apparent: "Quick Start is one of our top incentives. You hear many companies say it's one of the main reasons they located here." But just as crucial to business as the utility's power infrastructure is his team's structure. "We have someone in every region who's tied into the community," he says. "They know we're working for everybody." Gov. Deal says the No. 1 issue to come out of regional roundtable discussions that were part of his Competitiveness Initiative was educating the work force. He looks forward to using federal Race to the Top funding to take K-12 education in new directions, and the state has launched its Go Build Georgia program to educate students and parents about the opportunities available, at good wages, in skilled trades such as welding, plumbing, commercial driving and electric service. Currently, 16,500 jobs are available in the skilled trades in the state. The Technical College System of Georgia (TCSG, at tcsg.edu) administers the state's pioneering Quick Start training program. But it has its own expansion plans too: It's currently hiring educators for one-year appointments in Saudi Arabia, where it's helping create a new community college over the next three years. Dr. Sanford Chandler heads TCSG's new International Center for Technical Education, which since its debut last year already has helped establish two-way relationships with companies and governments in such nations as Germany, China, South Korea, Kenya and South Africa. Even within the technical college system, Deal says, "certain skill areas have a much higher placement rate than others, so we're moving to offer more courses into those course areas where the graduates can immediately become employable, and address shortages in our current work force." One thing there's no shortage of is knowledge and respect for Georgia Tech, which Deal says is second only to Coca-Cola in brand recognition when he travels abroad. Economic development has been a vital part of Georgia Tech's mission since its founding in 1885. "All around the world you find graduates of Georgia Tech who are working in business and industry," he says. "Tech is a huge resource for us from the standpoint of economic development. "Georgia Tech has partnered with companies like NCR and GE Energy, and UGA with many of the food processing companies in the state, to facilitate innovation initiatives and institute training programs," says Chris Cummiskey. "The Georgia Centers of Innovation also provide the expertise and connections to help Georgia's companies and strategic industries solve problems, grow quickly and compete globally." In addition to traditional tech transfer and incubation missions, Tech boasts an Enterprise Innovation Institute and an Advanced Technology Development Center. The school was selected in January by the U.S. Dept. of Transportation as one of 10 National Tier One university transportation centers, owing to its highly respected transportation and logistics research programs. And economic development specialists from the university recently helped Clayton County leaders launch a new strategic plan that builds on the county's Atlanta-area logistics assets. Meanwhile, Tech has teamed with the Korea Institute for Advancement of Technology (KIAT) to spot opportunities for Korean firms to conduct R&D and grow in Georgia. KIAT also oversees a master's degree program at Georgia Tech for Koreans. "They have such a broad alumni base, and it penetrates literally all over the world," Gov. Deal says of Tech. "The University of Georgia is making concerted efforts to do the same thing. Anytime we have foreign students studying in our country who graduate and then go back home, there is an opportunity to build on that." Deal also recognizes how such relationships have dovetailed with his trade missions to such locations as Turkey, Europe and South Korea. "The presence of Kia has really been a magnet," he says. "If you can show to a country such as South Korea that you are a good place to do business, and you have a major player such as Kia saying good things about you, that's the best recruiting tool you can have." Kia's largest supplier, Sewon America, announced in mid-August it would follow in its customer's expansion footsteps, investing $10 million and hiring another 150 people at its plant in LaGrange. Like the state itself, it's on the move toward a promising future. Plant Vogtle, a nuclear power plant operated by Georgia Power in Waynesboro, Ga., just south of Augusta, continues to proceed with construction of units 3 and 4 in a $14 billion expansion. Already granted its construction and operating license by the Nuclear Regulatory Commission, the project calls for unit 3 to begin commercial operation in 2016. Cavanna Packaging is one of several companies to have recently celebrated ribbon-cuttings in the Gwinnett County city of Duluth. n July, Texas-based Academy Sports + Outdoors announced it would expand its existing operation in Jeffersonville in Twiggs County, creating 250 new jobs. The project adds more than 500,000 sq. ft. to a complex the company has operated at the site since 2007, employing 625 people. In 2011, Academy added an e-commerce fulfillment center in Jeffersonville. Starbucks in March announced a new 140-job plant in Augusta for the manufacture of Via instant coffee and Frappucino ingredients. Peter Gibbons, executive vice president of global supply chain operations, said moving the work to Augusta from third-party plants in Latin America gives the company "a chance to control and streamline the supply chain." HK Logistics, a leading provider of critical logistics services, last fall located a new $30-million, 70-job distribution center at the Green Valley Industrial Park in Griffin, just south of Atlanta on I-75. Outdoor Network, one of the largest online suppliers of parts and accessories for marine and powersports enthusiasts, announced in June it will relocate its Internet fulfillment center to Albany, Ga., creating 112 jobs and investing $3.2 million. "In my 35 years doing business, I have never encountered such a warm, inviting business climate as I have in Georgia," said Tom D'Azevedo, owner of Outdoor Network, the parent company of Powersports Plus and Boats.net. OLI, a subsidiary of Italy's WAMGROUP, earlier this year invested $1.2 million at a new assembly and testing operation in Gwinnett County. "This project is another great example of our strong partnership with the Georgia Department of Economic Development's Foreign Direct Investment Team, who brought OLI to metro Atlanta, and the Existing Industry Team, who have worked with us in the expansion phase. We are honored that this global company has chosen to remain and expand its operations in Gwinnett County," said Troels Adrian, advanced manufacturing & supply chain project manager, Gwinnett Chamber Economic Development. • Okabashi Brands, a maker of sandals and flip-flops, is adding 150 jobs to its payroll of 200 at its plant in Buford. • Mitsubishi Electric Cooling & Heating has outgrown two spaces during its 20 years in the county, and early this year signed a lease with IDI to enable more growth, which will encompass the division's corporate headquarters. • In December, metals processor and distributor Ryerson announced a 25-job expansion of its warehouse operation in Duluth. • Encompass Supply Chain Solutions has relocated a divisional headquarters from Florida to Lawrenceville, where it will create 60 jobs and also offer product repair and distribution. • December 2011 saw Hyundai Construction Equipment Americas (HCEA) announce its headquarters and warehouse relocation to Norcross. The $10-million project will create 100 jobs over the next five years. Hyundai also revealed plans to build a major manufacturing facility in Georgia sometime in the next three to four years. "Our decision to move to Gwinnett and to Georgia was an easy one: we needed a facility that was strategically located not only for access to markets in the Southeastern United States, but to the rest of North America, and to South and Central America as well," said John Lim, HCEA president. • Significant infusions into Georgia's deal-closing funds boost the state's competitive status among its peers. A total of $78.5 million has been designated to the Regional Economic Business Assistance (REBA) fund, and $44.8 million goes to the OneGeorgia fund for rural communities. • Elimination of the sales and use tax on energy used in manufacturing was one of several measures recommended by the Georgia Competitive Initiative, the economic development plan developed under Gov. Nathan Deal. The tax will be phased out over four years beginning in January 2013, although criteria exist for which an immediate phase-out can be offered. • Discretionary elimination of sales and use tax for construction materials can be used for the expansion or location of a competitive project of regional significance. • The Mega Project tax credit applies to qualified companies — and now their affiliates — employing 1,800 new employees, and either investing a minimum of $450 million or meeting a minimum annual payroll of $150 million. Companies with a larger capital investment now can take advantage of an extended ramp-up period. The maximum number of jobs a company can claim was raised from 3,300 to 4,500. • Other measures included an expansion of the existing Freeport exemption for local inventory tax; enhancements in statutory job tax credits, R&D tax credits, port tax credits, and quality job tax credits. • The Employees' Retirement System of Georgia Enhanced Investment Authority Act means venture capital funds can now access state pension funds, thus creating a better environment for venture capital companies to invest in emerging Georgia companies. • A measure strengthening Georgia open records laws regarding economic development specifies that projects involving more than 50 jobs or $25 million in investment are protected from open records requests until a binding commitment has been made by the prospect company, or the project is terminated. For full details, visit Georgia.org.